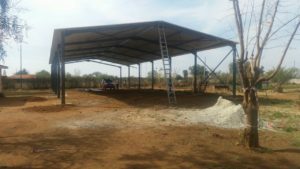 BUILDING ACTIVITIES: In the past few months we tried to find sponsors to help us with the building of the concreet floor and classroom under the big steel structure BOMA. Especially from our international network in Germany and also from the Netherlands itself we received good news. Thanks to GLOBAL Exploration / Wilde Ganzen Netherlands and also the Dominican Congregation Germany we received a big amount for the building project. The amount we received was even big enough to built the concreet floor, but also start to built the rough structure for the classroom. Or foundation funded the steel structure last year and we are very delighted that we managed to have other sponsors on board from Germany and the Netherlands. Last week (25 Sept.) the building company started with the foundations and preparations for the concreet floor and also building the classroom that will be used as Youth Centre. The 3rd and last fase of the building project will be the building of a small stage for performances, but also the finishing tough for the classroom like electricity, lighting, gutters, ceiling etc. BLANKETS CAMPAIGN: In July We had a visitor from the Netherlands Ms. Karin Jordens from the RoyalHaskoningDHV company. Karin knows the project already for some time, and during her last visit Maarten promissed to walk with her into the township together with one of the fieldworkers. 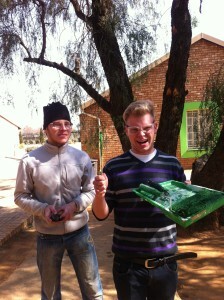 On our way to the project we spoke about all kind of things and also about winter in Afrika. Karin started a WhatsApp Campaign and asked her colleagues and friends in the Netherlands to support her in her campaign to buy blankets for the children. Within no-time Karin organised a big amount of money for the blankets, and at the end of the afternoon she also organised a skype meeting with almost all her sponsors to announce the outcome of this WhatsApp campaign. The 900 euro is made available to Abantwane Belanga to buy all the blankets. WORTEL36 – Maintenance crew: Not really a name that is very known to many, but it is the title for Ronald, Johan, Hugo, Remy, Janou & Wesley from Ulestraten – Netherlands. Ronald is our secretary and together with his friends and their sons, they travelled to SA to the project to do maintenance work at the project. In July the 6 men started at the project and within no-time and with a lot of energy and humor they did a lot of small jobs. Renewal of our board room, new watertabs, new toilet seats, lighting, new doors, ceiling, renewal of some of the washing basins, fixed some of the leaking pipes etc etc. During their maintenance work the WORTEL36 group also did a blanket campaign and after 3 weeks there was another wonderful donation. In total we could transfer 2345 euro into the the Abantwane Bank Account thanks to RoyalHaskoningDHV and WORTEL36. In total we could buy 85 blankets for our children. The building project as we started it in 2016 is in progress. The steel structure and the big roof (LAPA) are ready and as you look at it, it really is a big building. It was not always easy and every now and then there where discussions with the building company. But after a few months, the LAPA is at his place and almost ready. This year we hope (with financial support from sponsors) to finalise the cement floor and foundations, so that we can start using the LAPA als Youth Centre for our Youth of Sithand’Izingane but also for events at the project. At his moment there are serious talks with possible sponsors who are willing to help us. We already have a financial commitment from Global Exploration / Wild Geeze Netherlands and a 2nd sponsor is almost convinced to support us. We are waiting for technical drawings from the building company. 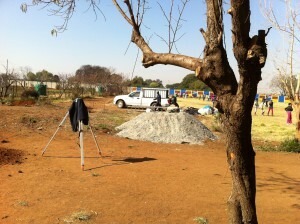 Planning for this year: cement floor 12 x 30 mtr; foundation for classroom 12 x 6 mtr and stage 12 x 6. mtr. After several years of asking our friends and followers of our foundation to support us, we are very delighted to announce that we started building the Steel Structure on the plot of the Sithand’Izingane care project in the Tsakane – Kwathema Township. Some weeks ago the cement and sand was delivered and yesterday the team from SM-STRUCTURES arrived and started digging the foundations. We are very proud that our Foundation, thanks to all our sponsors, is able to finance the Steel Structure and that we also can continue building the 2 storage rooms & stage after the Structure is in place. First of all the cement floor must be put in place and drawings for the classrooms are being prepared. We also received a wonderful donation from WILDE GANZEN / Global Exploration Netherlands that we will use for the upgrade of our sewerage system, drains and pipes. Yesterday we could start the building process and if everything is working according to the plan the Steel Structure will be ready 2nd week of July. On the 29th of March, Ronald en Miran Pluimakers from the Abantwane Belanga Foundation visited the Sithand’Izingane project. No just a visit, but a visit with a special purpose. Both Ronald and Miran visited the project to deliver a cheque on behalf of the learners from the St. Franciscus primary school in the Netherlands. This cheque was handed over to them just a few days before. The second present that they brought to the project was a whole bunch of plates and cups. This was already for some time on the wish list because the current plates and cups needed to be replaced. On behalf of the foundation and on behalf of the clients of Miran’s hair salon this wish could be fulfilled. 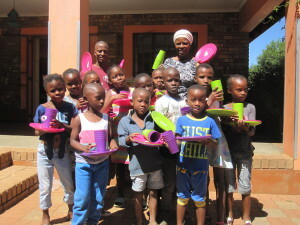 300 colourful plates and 300 colourful cups are now in use for the feeding scheme. 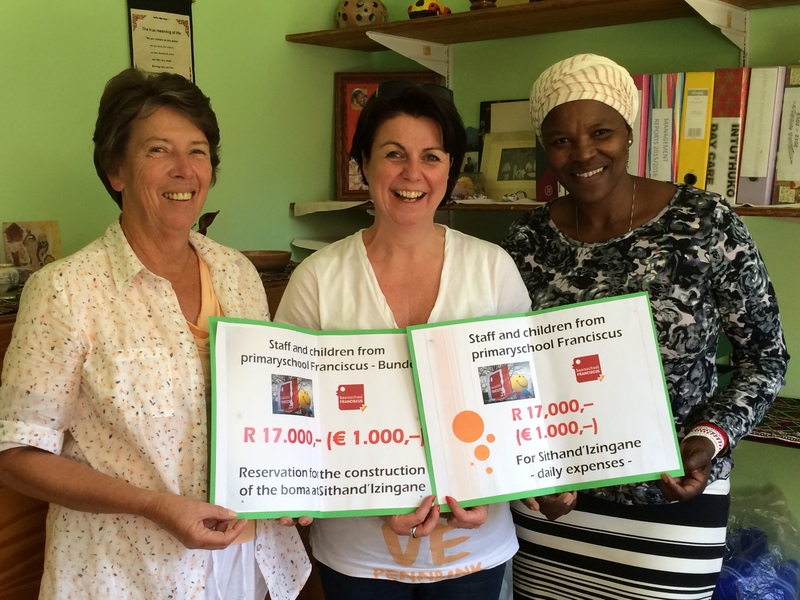 The cheque of 2000 Euro / ZAR 35000 was handed over to Sr. Mary Tuck – funder of the project and Ms. Thembi Aphane – project manager. As you know it is a kind of tradition to celebrate a donation like this, and therefore there was a lovely afternoon with music, singing, dance and some nice speeches from the children and Thembi Aphane. The money that was handed over will be used for the new building (BOMA) and in consultation with the management a part of the donation will also be used for some urgent maintenance issues. On behalf of all the children from Sithand’Izingane we would like to thank all the children from the St. Franciscus primary school for this wonderful donation. The building project started already last week and the first preparations are busy. Just like last year we also organised our Christmas Funding in 2015. Friends, Family, colleagues, former and current volunteers, friends of our foundation received a few messages about our Funding. The accent for this year was focussed on maintenance and building a new BHOMA. As the foundation we would like to share and support with financial support but also helping to create the technical drawings and at the time of building also lend a hand. After a few messages about the plans, the first very nice and warm response arrived in our postbox. Also the first donations arrived into our account. Even via the donation website GeefGratis.nl some spontaneous donations arrived. So every now and then our treasurer sent us an update and the message that somebody would love to donate but didn’t know hoe to do this. After 2-months the counter has stopped and we reached a wonderful and final amount. Thanks to the weak South African Rand we can transfer the euro’s into a lot of Rands. It is a wonderful donation for the project. We spoke to the project and agreed tha tee will leave the final amount in our foundation account until the moment has arrived that the building preparations process will start. Talks are underway with the project board members about the way forward, and within a few weeks the board will tell us te name of the person who will be responsible for the building process. The BHOMA will have about 400 seats for our children and also a small stage where we can perform during events. The BHOMA is the first step in a range of building plans that will take place in 2016 – 2017. As a foundation we are very happy and pleased that there are so many people who love to support the work we are doing for the project. It is wonderful to experience that people want to hold hands with us, and that gives hope for a bright future for the project. 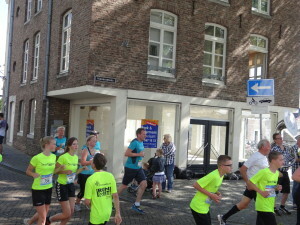 This year we joined the run event “Maastrichts Mooiste 2015”, that was organised for the 10th time. Participants could choose between the 5 and 10 kilometer, the 10 English Mile, and for the children there where some kids runs. Ronald our treasurer and runner joined the 5 km run. The LIOF in Maastricht – Netherlands is also participating during this event and therefore they changed the name in “LIOf’s Mooiste”. Together with all their clients they like to share some time in an enjoyable and sporting environment. Next to the sporting element there is also a annual good cause that is supported by all the runners, and for 2015 the Abantwane Belanga Foundation was the chosen good cause. 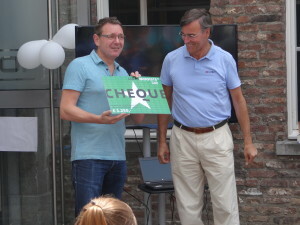 Jérôme Verhagen, managing director of LIOF gave a short address to the public at the end of the event, and he delivered a beautiful cheque with the amount of €1500 for the Foundation. Ronald did a short presentation about the foundation and the work we are doing . We would like to say: “thank you” to all the sponsors who, thanks to the LIOF, gave their support to our work for the children of the Sithand’Izingane project. Via this website and Facebook we will keep you informed about the progress of our work and how e us the money to create a better life for the children in the project. On behalf of our board members Anke, Katrin, Miran, Marlies, Ronald I would like to thank all our sponsors, friends and followers for their support in the last year. Hopefully we can continue our cooperation also in the years to come. We have sent our first newsletter last month as part of our annual Christmas Funding, that we organise since a few years. Nice comments come in and we are delighted. It is always very nice and heartwarming to know that there are people who work together with you and that you receive their support, and also want to do this financially. We will keep our followers informed about the progress, and at the end of the Christmas Funding on 31 January 2015 we will announce the results again. On YouTube we came across a very interesting movie with a message that appealed to us. The clip is part of a song by the band “The Script” with the number Superheroes. We thought it was a heartwarming story and want also to share with you. Peculiarity is that the clip was recorded in the Alexandra Township in Johannesburg. Let us know what you think after seeing the clip. Last month, our 2 Dutch volunteers Sjors and Sam Ruiters visited the Sithand’Izingane Care project. 4 weeks they where part of the project, worked together with the local people and where part of our Sithand’Izingane Care project family. The Abantwane Belanga foundation together with their partner in South Africa Sisiza-Ukusiza in Johannesburg where the proud organisers of this wonderful volunteer trip to the project. Sjors, a graduated cameraman, together with his brother Sjors prepared a short movie about their experiences at the project. Within 4 weeks many things happen and you are part of many experiences and emotions. You get more and more involved in all this and go through these all day experiences. 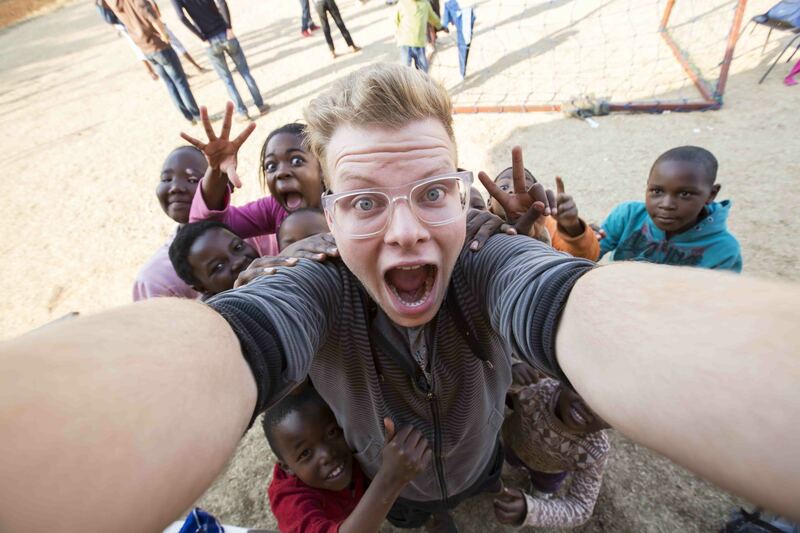 Sjors and Sam made a short movie of all this, and we invite all of you to watch this short movie and have a look at the role that you can play as a volunteer at the Sithand’Izingane care project. The Abantwane Belanga Foundation and Sisiza-Ukusiza South Africa invite persons interested in volunteer work to take part in our volunteer program. There are a few possibilities to meet us and have your questions answered. 2: Visit our information stand during the Wereldwijd vrijwilligers Markt / Worldwide Volunteer market in Utrecht on Saturday 22 November 2014. The final location for this volunteer market will be announced shortly via this website and our Facebook page. Follow us and join us. Two weeks ago Sjors & Sam Ruijters from the Netherlands arrived at Sithand’Izingane Care Project to start their 4 weeks volunteer-work holiday. Both of them arrived on Sunday morning at OR Tambo Airport in Johannesburg. Because we don’t have our own accommodation at the project, the two volunteers spent their time at the Melville Backpackers. Melville is a student area in Johannesburg and is very lively and pleasant. The volunteer trip is organised by our partner Sisiza-Ukusiza, the company in South Africa of our chairperson Maarten and Anke, also one of the board members, and is supported by our Abantwane Belanga foundation. The next 4 weeks Sjors and Sam are working in the kitchen, the garden and also the after Care program. Next to that we also travel to see Johannesburg and the Pilanesberg Nature Reserve to spot the Big Five. Last Saturday we went to Hillbrow, for many people a so called No Go area in Jo’burg. But we have seen that these stories don’t mix with the reality. 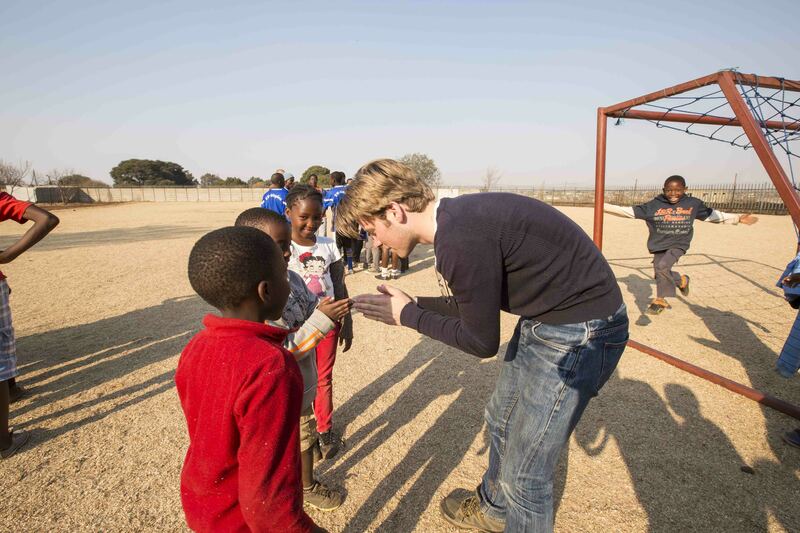 The next few days Sjors and Sam will also work closely together with our fieldworkers during their work in the Kwathema township, and have a close look at the work they are doing. People who want to know more about volunteer work in the Sithand’Izingane project can sent an @mail to: maarten@sisiza-ukusiza We will sent you the necessary information. Long term and short term internships; volunteerwork is possible.